How U.S. Bridges Stack Up (Illustrated to Scale) #infographic ~ Visualistan '+g+"
How do American bridges stack up when compared by length? 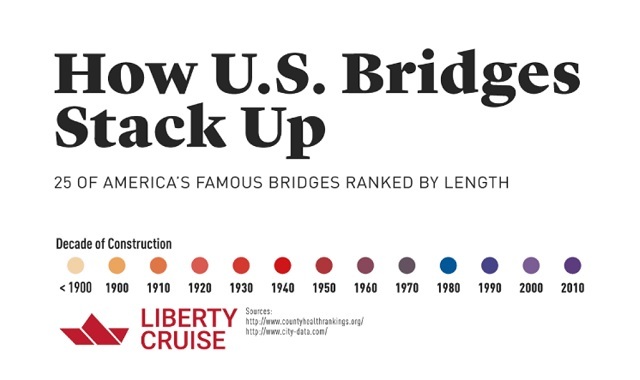 This infographic from LibertyCruise.nyc ranks twenty five famous bridges throughout the United States by their impressive lengths, and shares some truly interesting facts about each. The longest bridge in America is the Lake Pontchartrain Causeway, which tops out at an impressive length of 23.81 miles. It is not only the longest bridge in the U.S., but it’s also considered to be the longest continuous bridge over water in the entire world! Which city would you expect to find the world’s busiest bridge, that sees more than a quarter of a million motor vehicles pass over it ever single day? If you guessed New York City, you’d be right! The George Washington Bridge is the busiest one in the world due to it being the most common path out of the big city. How does the longest bridge in your city compare to the ones featured here?